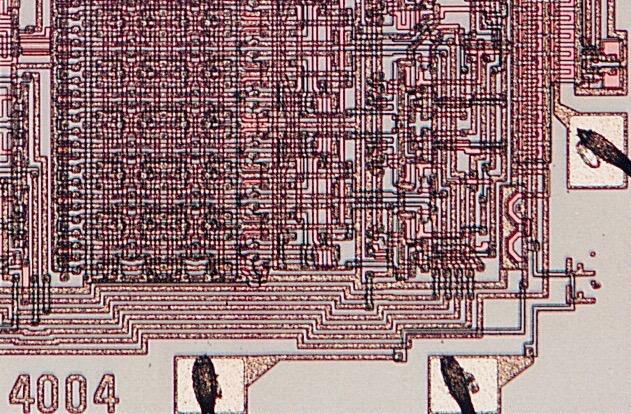 The 4004, the world's first microprocessor, is signed with the initials F.F., for Federico Faggin, its designer. Signing the chip was a spontaneous gesture of proud authorship. It was also an original idea, imitated after him by others. Faggin initially etched the F.F. inside the design. Later he moved them to its border, like the autograph on a work of art. The signature is a particularly poignant testimony because, at the time of its birth, the first microprocessor, far from being considered a milestone by Intel's management, represented a diversion from the mainline business of the company which was memory chips. The birth of the 4004 was an intense moment witnessed by Faggin alone, working into the night in the deserted Intel labs. He had received the 4004 wafers from the manufacturing line at around 6 PM, in January 1971, as people were leaving for the day. With hands trembling and heart pounding he loaded the wafers in the wafer prober and connected it to the tester. A sigh of relief raised from his chest, above the humming of the instruments, as he observed electrical activity in the device. As the testing progressed, the tension was gradually transforming into elation as all the critical functions showed to be operating properly. At around 3 AM, exhausted and ecstatic, Faggin left the lab. At home his wife, Elvia, was waiting for the news. "It works"! he announced, and they shared the happiness in this moment of triumph. On the lower right-hand corner of the 4004 chip are the initials F.F. for Federico Faggin, the project leader and author of the silicon design. He was the leader of the design/development project of the first microprocessor, and brought it to its successful conclusion. Faggin did the detailed design work (logic design, circuit design, chip layout, tester design and test program development) with help from Masatoshi Shima, a Busicom software and logic designer without any previous chip design experience. Busicom presented to Faggin the engineering prototype of their calculator with the first 4004. Faggin in 1996 donated it to the Computer History Museum in Silicon Valley. He was the original developer of the Silicon Gate Technology, at Fairchild Semiconductor in 1968, the first commercial self-aligned gate process, and the designer of the world's first commercial integrated circuit using the silicon gate technology: the Fairchild 3708. This semiconductor technology was copied by Intel and made into its core manufacturing technology, enabling the early realization of high-performance memories and the microprocessor. Faggin made two other key inventions at Fairchild: the Buried Contact and the Bootstrap Load. At Intel he applied these innovations to build the first microprocessor. They were essential in making the 4004 a reality with the technology available in 1970. Faggin also created the basic Methodology for Random Logic Design using silicon gate technology. This methodology did not exist at Intel or anywhere else until he developed it in 1970. It set the style of design used for all early generations of microprocessors at Intel. He also created a very innovative layout and invented many special circuits, for example: a static MOS shift register, a new type of counter and a new automatic power-on reset circuit (US patent 3,753,011). He demostrated that the 4004 could be used for applications other than calculators and vigorously campaigned inside Intel to make the 4004 available to the general market. Two patents cover Intel's MCS-4: patent no. 3,821,715, Memory System for a Multi-Chip Digital Computer, in the names of Ted Hoff, Stan Mazor and Federico Faggin (filed January 1973, granted June 28, 1974); and patent no. 3,753,011, power supply settable, bi-stable circuit, in the name of Federico Faggin (filed March 13, 1972, granted August 14, 1973). After designing the 4004, Federico Faggin intensely promoted within Intel the broad commercialization of microprocessors, which at the outset were only custom products, to the general market. He was in charge of the design and development of all Intel's early microprocessors: the 4004, 8008, 4040 and 8080. He conceived and defined the architectures of the 4040 and of the 8080, and supervised their design and development. He presented his architectural proposal for the 8080 to management in early 1972, urging his boss to start the project in earnest, but management wanted to ascertain the market reaction to the recent introduction of the 4004 and 8008 before committing additional resources. Nine months of competitive advantage were thus lost due to this indecision. Intel was then a semiconductor memory company and microprocessors were not a priority. The silicon gate design methodology and the novel layouts created by Faggin for the 4004 provided a source of techniques and implementation examples that were subsequently used at Intel and other companies for the design of complex random logic chips.